A full account of the methodology used for the Atlas surveys, data validation and analysis is given in The Birds of Berkshire, chapter 4; a summary is given here. Tetrad survey: The spatial resolution for the 2007-11 and 1987-9 Atlas was the tetrad – 2km x 2km squares based on the Ordnance Survey grid. The whole of all tetrads (394) containing any part of Berkshire were included in the Berkshire tetrad survey and used for distribution maps. However, for the species accounts in the avifauna of uncommon or rare species, only records occurring within the county boundary are included. Timed Tetrad Surveys (TTVs): The purpose of the TTVs was to estimate the relative abundance of the species present in a tetrad. The methodology was that used for the BTO/BirdWatch Ireland/SOC Bird Atlas 2007-11 and the data contributed to both the Berkshire and the national atlases. TTVs entailed two surveys of each tetrad in the summer and two in the winter in any of the four years of the survey period. Visits lasted two hours and surveyors were asked to cover as much of the tetrad as possible in the time available and, in particular, to visit all the major habitats included within it. Roving surveying: Surveyors were asked to contribute records to the BTO Atlas database of the presence and tetrad location of any species and associated breeding evidence. To complete the database, records from a range of other sources were added: Berkshire County database, Birdtrack, BTO Nest Record Scheme, BTO Ringing Scheme, Breeding Bird Survey, Heronry Census. Final dataset: A total of 164,774 records from all sources were included in the final breeding season dataset. The records were for the months April-July in 2008-11; records outside these periods were included only if they provided evidence of breeding. A total of 120,665 records from all sources were included in the final winter dataset. A dataset of records of non-breeding, migrant species was compiled for the spring (March-June) and autumn (July-October). Data analysis: The data used were subject to a validation process to correct or remove errors in data entry. They were then analysed by tetrad to provide a summary on which the maps were based. The summary data are available in the Data Archive. For map display, the abundance data were binned into six categories as fractions of the average abundance for the tetrads in which a species was found: >0-0.5, >0.5-1.0,>1.0-1.5, >1.5-2.0, >2.0-2.5, >2.5. 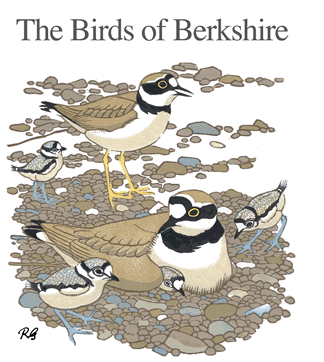 Species metadata: Each species account includes a description of its status in Berkshire and, where applicable, the conservation status in 2013 (Birds of Conservation Concern 3) and the national abundance trend from BTO Birdtrends, accessed in August 2013.